United Black Ellument presents The B.L.A.C.K. Academy 2015 – Building Leaders And Cultivating Knowledge. This free six workshop series is designed to provide personal and professional development to members of Dallas’ Black same-gender-loving community. Individuals who participate in this program will partake in facilitated trainings and workshops with some of Dallas’ most notable upcoming professional talents as well as walk away with a wealth of knowledge that is sure to make them marketable in an ever competitive society. 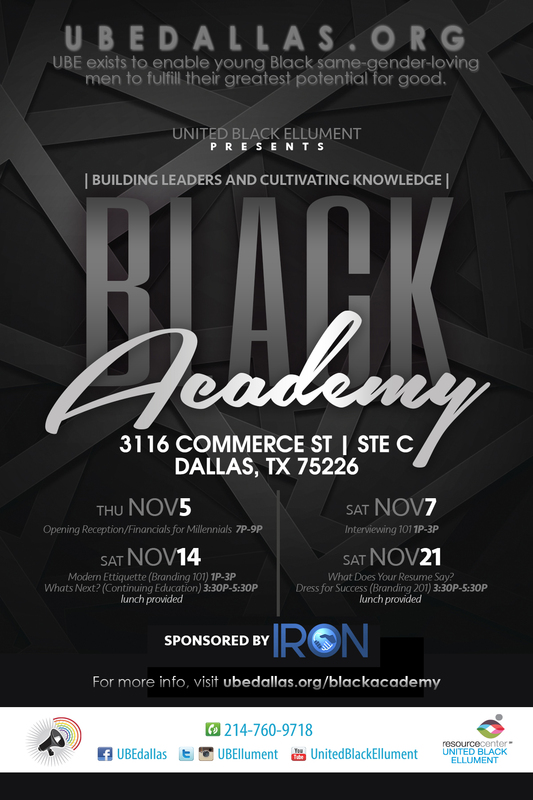 Each workshop will take place at the UBE Community Center located at 3116 Commerce St, STE C Dallas, TX 75226. Financials 4 Millennials is a contemporary and generation-specific workshop that focuses on financial management, saving, budgeting and credit repair. This dynamic workshop will provide participants with tangible tools to ensure that he/she is making responsible financial decisions in the early years to set up for financial success in the later years. Securing an interview is only one-third of the battle when seeking employment. Join us for Interviewing 101and get hands-on rehearsal and exposure to contemporary interview rubrics that will surely set you up for success in your next opportunity. Contemporary Ethics is a tailored approach to the evolution of professionalism. In this workshop participants have the opportunity to engage in dialogue and activities that help identify what are the do’s and don’t of workplace behavior, colleague engagement, and conflict resolution. Life after high school can be an amazing time of discovery, but life can also have some dramatic changes for better or worse. Join Post Secondary Options, for the opportunity to discuss and engage with college recruiters, military personnel, and other workforce options to create your trajectory of self-sustainability. What do you look like on a single eight by 11 piece of paper. Before meeting with potential employers in a formal interview, this is the only tool you have to speak to your character and abilities. Join this workshop to ensure that your abilities and talents are equally as appealing on paper as they are in person. Appearance can be the pass or fail to any opportunity for advancement. Join this workshop to discuss the evolution of professional dress and business casual attire. Participants in this workshop will also have the opportunity to learn and practice tying a tie in several different styles, identifying appropriate attire, and make exclusive selections from the UBE Business Attire closet. By getting on and adhering to medical treatment, HIV-positive individuals can achieve viral suppression (a very low level of HIV in the blood, also referred to as undetectable). HIV is not curable, but lowering the amount of HIV in the body can keep a person healthy, help them live longer, and greatly reduce thier chances of passing HIV on to others!